Click through the images to learn more about FRED! What size plastic does FRED pick up? FRED’s debris collection conveyor belt picks up floating debris sized from about 10mm to 1m long. What does FRED do when the bins are full of plastic? FRED goes to the Mothership for offloading collected debris and then back to garbage duty! What will Clear Blue Sea do with the collected plastic? Clear Blue Sea is partnering with sustainable recycling organizations to ensure the plastic is repurposed and does not end up back in the ocean! How does FRED ensure that sea life stays safe? FRED comes equipped with sensors and pingers to help keep marine life away during collection. FRED also moves at a slow speed so animals can easily swim away or avoid FRED altogether. How does FRED survive bad storms? As a pre-caution, FRED will avoid bad weather because he won’t be able to collect plastic anyway during a storm. If bad weather suddenly strikes, FRED will go into lockdown with his “stow” mode to keep all his subsystems safe. How is Clear Blue Sea funded? Clear Blue Sea has achieved most of its milestones through student interns and volunteers with minimal funding. Clear Blue Sea needs help from the community to make a difference. You can donate, volunteer, or help raise awareness. Still have a question? Want to learn more about how you can help? Click on the button to contact us! How does FRED differ from other Innovations? 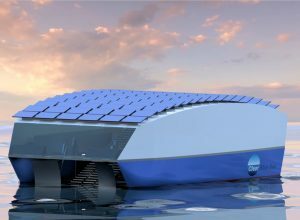 FRED is a large, unmanned, semi-autonomous ocean-faring robot powered with renewable energy, designed to clean up harmful floating debris from marine environments such as bays, rivers, and oceans. Clear Blue Sea is currently prototyping FRED subsystems with help from the San Diego community. 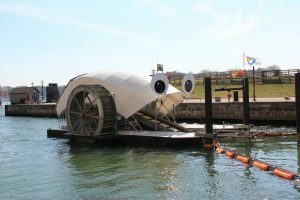 Mr. Trash Wheel is a dock and conveyor system cleaning up a river in Baltimore before it reaches the Harbor. On most days he is powered by the water wheel propelled by the currents from the river, but also has solar panels if extra power is needed. He is one of our favorite innovations as he has a sense of humor and posts daily on Twitter! 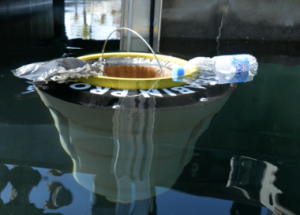 Invented by some Australian surfers, the Seabin is like a floating trash can that is effective in harbors and bays to collect floating debris. It’s rim lies just beneath the surface of the water so nearby floating junk is pulled right in! It uses a pump to constantly act like a sinkhole and allow water flow to continue. Humans nearby need to check and empty it often. 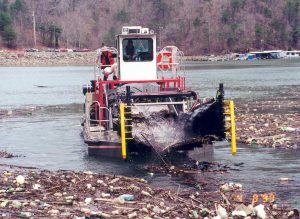 The Trash Hunter is an example of a debris skimmer, manned technology currently used in lakes and bays to remove debris or weeds cluttering the water. They typically use a belt conveyor, mechanized grabbers, and water jets to direct debris to storage. The Ocean Cleanup is a nonprofit organization based out of the Netherlands. 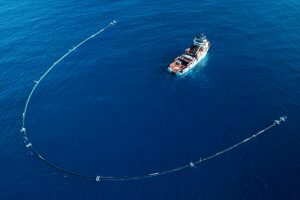 Their innovation is a long, U-shape boom-and-skirt array that floats with the currents to collect ocean plastic. They have raised nearly $50M of funds and as of January 2019 were testing their first ocean-ready prototype. What else is being done about Ocean Plastic Pollution? The United Nations Environmental Program has hopes to inspire policy change based on ocean plastic research. The 5 Gyres Institute empowers action against plastic pollution through science, art, and education. Dr. Jambeck at the University of Georgia analyzed data on plastic production to derive the “8 million metric tons each year” so often quoted in the media. In addition to developing FRED, Clear Blue Sea is raising awareness through social media such as Instagram and education to help change our actions as a society.